Medium voltage underground cable is designed to be used and not seen. Padmounted electrical transformer boxes containing and connected by underground residential distribution (URD) cable are a ubiquitous sight throughout residential neighborhoods, spaced on average 330 feet apart. Consumers who live in the community are generally unaware of the jumble of cables that each box comprises, and they rarely need to consider whether the URD itself is in an adequate state of repair. Most utility providers, on the other hand, are in a constant state of responding to aging cable and the threats it represents. Photo 1. A portion of the electrical cable insulation is removed to attach an injection adapter in preparation for injection of Cablecure rejuvenation fluid. Over time, utility companies face significant challenges for addressing deteriorating URD conditions. URD cables are most commonly degraded when moisture diffuses into the cable’s dielectric layer, gradually diminishing the cable’s insulative properties. This condition, called water treeing because of the tree-shaped structure observed when the degraded cable is viewed microscopically, is the most common contributor to URD reliability issues. When the insulation on the cable connecting two transformers degrades to a point of failure, the lights go out in the entire neighborhood. Aging URD cables are a growing problem in communities around the world, disrupting customers and causing business challenges for utility providers. But in most cases, the traditional remedy for URD cable failure—taking the impacted cable out of service and putting new cable in its place—has proven to be unfeasible. When cables fail, the resulting outages and the replacement work required to restore power create logistical problems that are usually unpredictable and expensive—costs that must be absorbed by the provider, the customer, or both. Meanwhile, customers often experience multiple outages as the providers install new cable, often disrupting the customers’ property and landscaping in the process. Photo 2. Lineman fans strands of conductor in preparation of electrical cable fluid injection procedure. 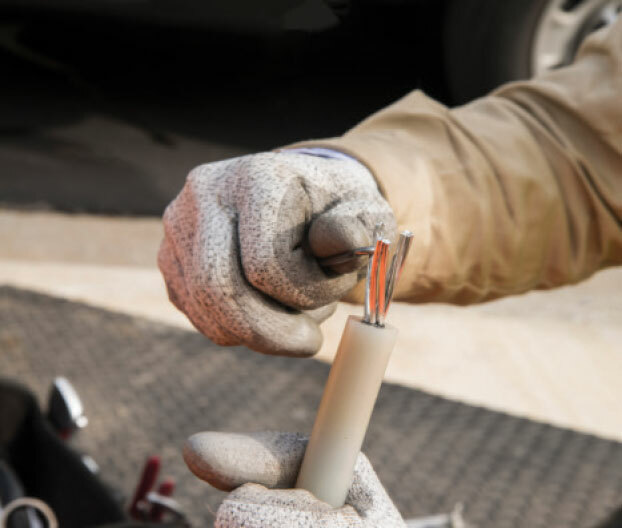 When rehabilitating aging URD infrastructure, many utility providers forego cable replacement and opt for rejuvenation as the proven superior method for fixing damaged cable. With cable rejuvenation, the affected cables are left undisturbed and injected with compounds that restore each cable’s dielectric strength, effectively adding the same value as a new cable but without the burden of time, cost, environmental disruption, and consumer downtime associated with cable replacement. This method was first developed in 1986, and its use has steadily gained adoption and popularity in the 30 years since. Rejuvenation technology focuses on the injection of silane-based fluid into the strands of aging medium-voltage power cables. The fluid is injected by accessing cables through transformers or other cable termination points. Technicians typically open two adjacent transformers and de-energize cables in a way that does not impact power to customers. Then, specialty fittings are attached to each end of the cable to allow for fluid injection. As the fluid moves through the cable, it migrates into the conductor shield and insulation. The chemistry and the physics of the insulation are modified, and the result is a cable that is returned to full dielectric strength in as little as seven days. Photo 3. The rejuvenation fluid enters the conductor via an injection pin and injection adapter that is connected to the cable end. The use of cable injection is approved for capitalization by the Federal Energy Regulatory Commission and hence does not impact tight operation and management budgets. Engineers have developed a variety of injection fluids and techniques over the years, enabling technicians to deploy specific processes depending on a given cable type, circumstance, or environment. The technology is also easily adaptable to different cable configurations, including splices in the cable. In these cases, technicians create splice excavation pits measuring roughly six feet square and four feet deep. These pits have far less impact on landscaping than the trenching or tunneling typically required for cable replacement. Photo 4. Injection tanks holding Cablecure 732 fluid during rejuvenation process. With sustained pressure rejuvenation (SPR), cables are restored to full dielectric strength in seven days, and injection can be completed in a single day. Using a time-domain reflectometer (TDR) device, check each segment for splices, neutral corrosion, and overall length. 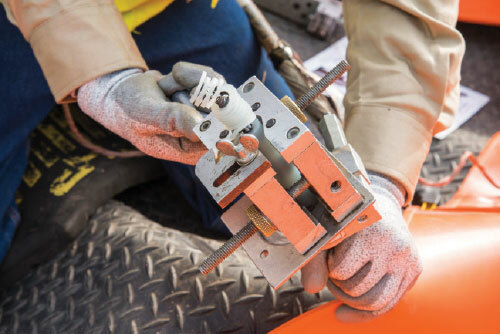 If splices are present, technicians pinpoint their locations using a radio frequency locator and measuring wheel, then dig a pit to expose the spices and replace them with new splice connectors and injection adapters, using templates to insure proper injection adapter placement. Inject each segment at a moderate pressure. A 300-foot segment (100 meters) typically takes 30 minutes or less to inject. Following injection, technicians remove all equipment and install standard elbows at each end of the cable. Re-energize the rejuvenated segment of cable, and then move on to the next segment. Using a TDR device, check each segment for splices, neutral corrosion, and overall length. 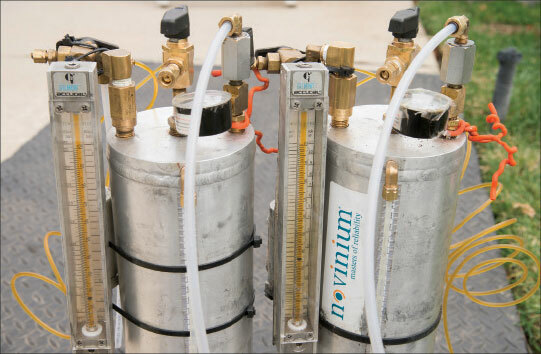 Perform air flow testing to confirm the rejuvenation fluid will flow properly. Re-energize the cable segment, and with the transformer closed, begin the injection process. With iUPR, injection typically takes 24 hours or less to complete. The following day, technicians remove all equipment. Except for the initial installation of the injection components at the terminations, the cable remains energized throughout the process. Cost savings. On average, a rejuvenation program yields a 40 percent savings over abandon-and-replace programs. 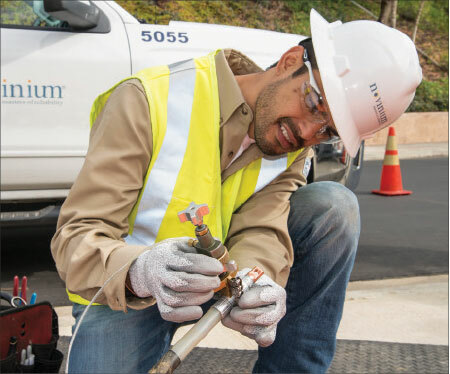 For utilities facing ever-increasing cable maintenance and management demand, rejuvenation helps address and repair more miles of cable for the same budget, compared to replacement. Ecological impact. Cable rejuvenation reduces new pollution: no resources are consumed to produce new cable, no diesel fuel is spent for installation, and the environment benefits when cables are not abandoned in the ground. For every 10-mile run of cable rejuvenated, cable injection provides at least a 3,000-metric ton reduction in CO2 equivalent. Each meter of cable that is injected, rather than replaced, saves 195 grams of aluminum, 484 grams of copper, 963 grams of plastic and 1.09 gallons of diesel fuel. Fewer outages. Because utilities can perform rejuvenation proactively rather than waiting for an emergency, there are fewer occasions when customers will be without power. Even during injection, customers experience a relative continuity of service, as opposed to tolerating planned outages as required for replacement. Low failure rate. In the past 30 years, more than 116 million feet of cable injected, and more than 300 utilities on five continents across the globe have used cable rejuvenation. In that time, the overall post-injection failure rate is less than 1 percent. Mr. Glen Bertini has more than two decades of working with cable-rejuvenation technology beginning with its development at Dow Corning in 1986. He has published more than 45 articles and 31 patents on cable rejuvenation and related technologies. Mr. Bertini was the 1992 co-recipient of the prestigious R&D 100 award for cable rejuvenation and the 2006 winner of the $100,000 Zino Zillionaire Investment Forum award for the best investment opportunity in the Pacific Northwest. In 2010, he won the Puget Sound Engineering Council’s Industry Engineer of the Year award as well as Seattle Business Magazine’s Top Innovators award. Mr. Bertini is a senior member of the American Institute of Chemical Engineering (AIChE), an Institute of Electrical and Electronics Engineers (IEEE) fellow, a voting member of the Insulated Conductors Committee (ICC) and a licensed professional engineer. Bachelor of Science, Chemical Engineering, Michigan Technological University.